How much does an ounce of weed cost? Someone new to buying cannabis for the first time will typically start with a smaller amount of weed. Before learning how much cannabis costs, it’s essential to learn the answer to how many grams are in an ounce. We also explain how many grams are in a pound with images that help you get a better visual understanding. We break down the cost of cannabis for those new to buying weed. Now that millions are legally buying pot for the first time, they have plenty of unanswered questions. The most common question waiting for an answer is: What’s a fair price to pay for your weed? Well, from this article forward, you’ll never need to ask that question again. People want to make sure they’re not being ripped off. They want to make sure a product they purchase is worth the money they’re paying for it. The list goes on and on when we’re trying to weigh the cost/benefit of our purchases. This kind of thinking is what drives prices and encourages competitive marketing in today’s society. One thing is for sure, the legalization of cannabis has made the most significant impact on how much you pay for your cannabis products. 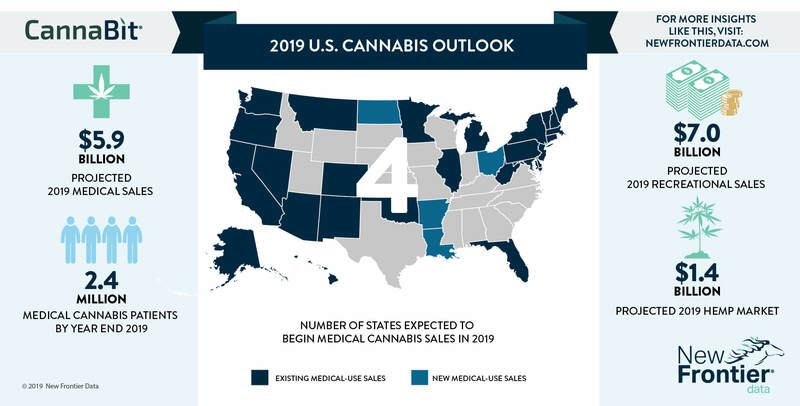 Marijuana sales continue to explode as more states begin to legalize cannabis for recreational and medical use in 2019. Weed prices continue to go down as more sales increase. I am someone who grew up smoking cannabis in the bay area through the early 2000s. During this time I also moved to Texas for a few years in 2010 and seen the massive increase in the price of weed in a state where it’s illegal. The quality was the worst I have ever seen, and the weed sold on the black market contained a lot of seeds. I couldn’t believe the price was double the cost of what I paid in California. Living in Texas allowed me to see how privileged I was to live in a state where high-quality cannabis was available 24/7 (at reasonable prices). The first factor to consider is, how much does the cannabis you purchase weigh? Weight is what establishes the baseline price. quarter pound (QP) = 112g or 4oz. half pound (HP) = 224g or 8oz. pound = 448g or 16oz. If you want to buy cannabis, you will have a hard time finding a shop that sells less than a gram. The answer to how much a gram of weed cost varies on quality and location. You’re looking at a range between $7/g and $20/g, before tax, on raw cannabis. For concentrates and cartridges, the range is far greater and you can spend between $10/g and $100/g. Edibles are priced mostly by their quantity and strength. Typically, edibles have their total THC amount listed in milligrams on the packaging. A single dose of THC is about 10mg, and the price is based on how many milligrams are inside of the edible. Different brands price their edibles on what they think is fair, compared to the quality of the edible. One gram is the building block of measurement used for weighing cannabis. There are 28 grams in one ounce, and 16 ounces equal 1 pound. The measurements trickle down accordingly and leave us with this weird system of mixed units. Although you may occasionally find shops selling less than a gram, it’s not likely. Price per gram will generally stay the same until you get 3.5 grams or more. Once you hit 3.5g, the metrics system of measurement morphs into the standard system. You might wonder how much does a pound of cannabis cost? This is the point where you may start to receive a substantial discount for purchasing a larger amount of weed. It works like buying anything in bulk; the more you buy, the cheaper it gets if you look at the price per gram. Depending on where you live, the average price of an eighth of weed cost from $15-$65 for top shelf. How Much Does A Quarter Of Weed Cost? 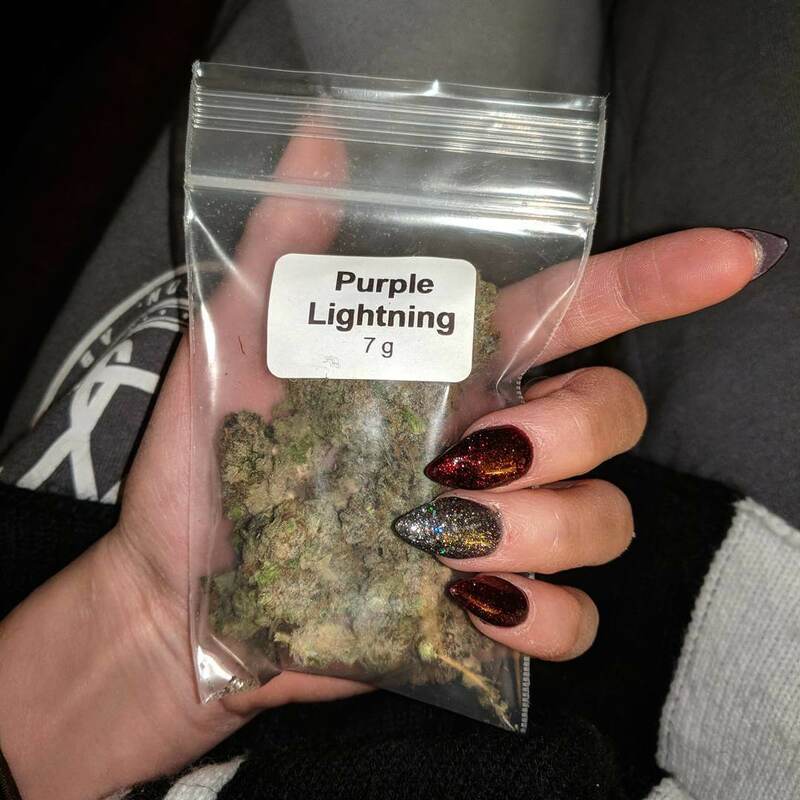 Living in the Bay Area, I would typically pay $90 for a quarter of weed when an eighth would cost $50. This was during a time where cannabis prices were peaking during the 2000s. The price of cannabis begins to decline in California after it became legal for recreational use in January 2018. It’s now 2019, and the prices continue to be at an all-time low. As someone who resides in California and knows plenty of people selling cannabis, I can provide some insight into the weed prices in California. Of course, the prices of cannabis available in the dispensary is going to be more expensive than the prices on the black market. The price difference is huge if you can buy directly from the grower. Below are some average current California weed prices from the black market and dispensaries. Top shelf (Black Market weed prices) – Well connected to regular black market prices. When you buy your weed on the black market, the variables of price can and will be independently controlled by drug dealers. How Much Does An Ounce Of Weed Cost In Oregon? 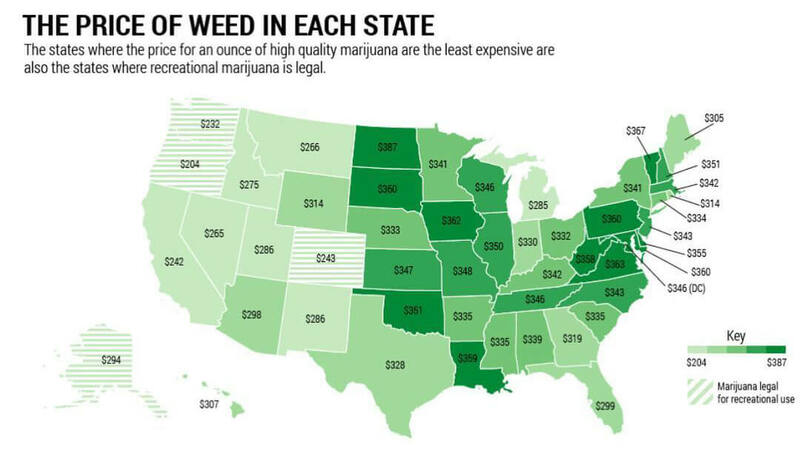 Oregon has taken the lead for the best weed prices in the USA. 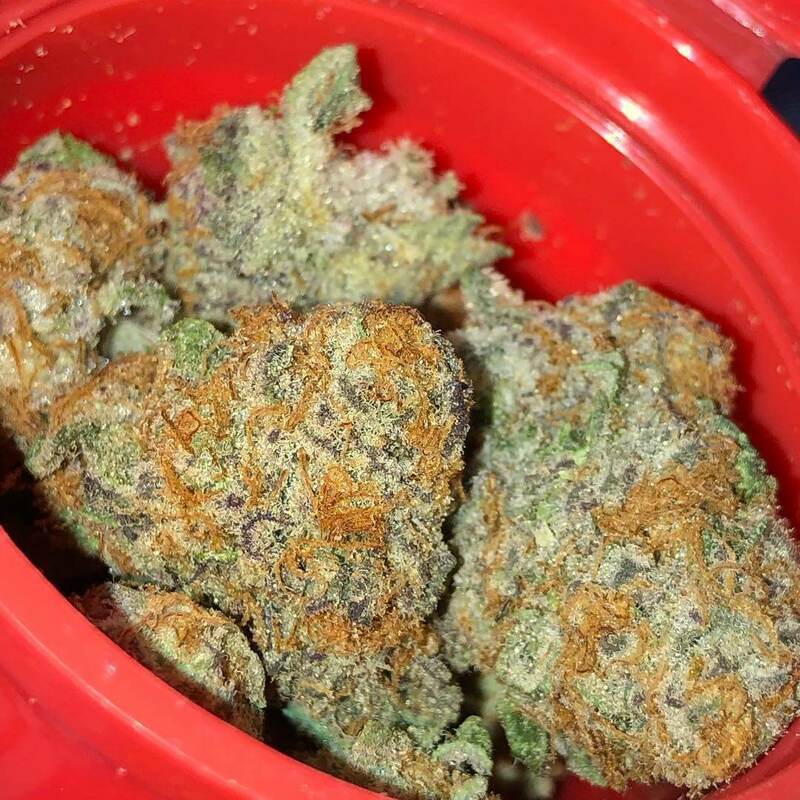 A Reddit user posted an ounce of what appeared to look like greenhouse bud for $35.00. There was another Reddit post of an ounce of outdoor cannabis for $80 from a dispensary in Oregon. These prices are unheard of in illegal markets, and it’s good enough to cause people to drive and fly for these low weed prices. It’s quite astonishing to see these price so low from a California weed price perspective. I know a lot of people who sell weed in California, and none have offered me rates as low as the Reddit post. How Much Does A Pound Of Weed Cost? The price of a pound of weed has plummeted in states where cannabis has become legalized for recreational use. 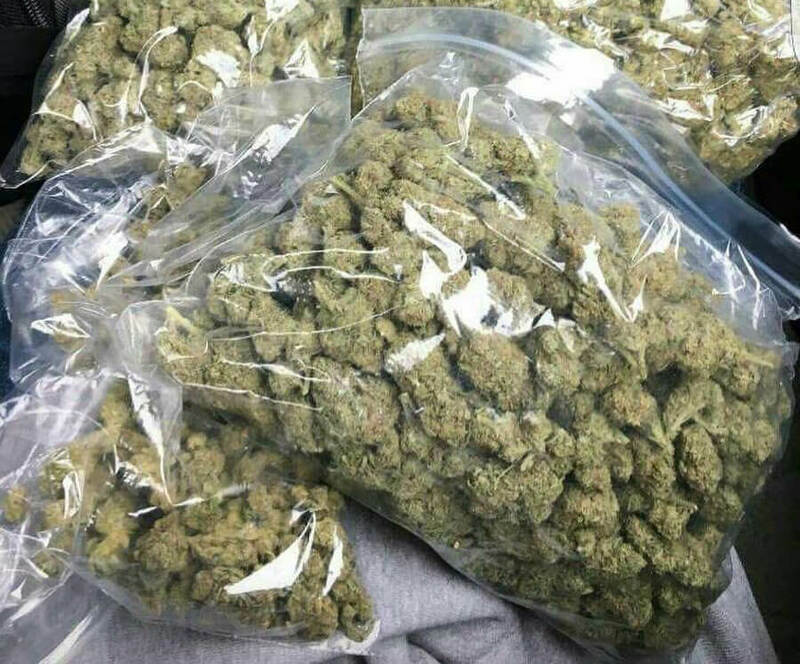 Buying a pound of weed will get you the best deal. However, in California, individuals can only carry one ounce. If you get searched and they find more you might face charges related to distribution. In the USA, pound prices can vary massively. The primary influence is the legality of the market. If you send a pound from California to the East Coast, you can charge a lot more than what you would get in Cali. In legal markets, cannabis prices have declined massively, even though the consumer has to pay taxes. You will be able to buy a pound of outdoor-grown cannabis for $1000. Indoor grown Cali weed (top shelf) is going for $1800 a pound. This quality of cannabis is considered Top Shelf, which is the best. So what’s the difference between the grades of cannabis, and how do those differences affect the price of weed? The different grades of quality for weed, are like seeing “Regular, Plus, Premium” at the gas station. Do people commonly wonder why you’d pay $2.50 for premium gasoline when you can pay $2.15 for regular unleaded? But, anyone driving a high-performance vehicle will tell you they’d never fill their car with low-octane fuel. A lot of cannabis consumers have the same mindset, which is where marijuana’s price foundation begins to crumble. You ask two people what the price of gas is, and one says $2.15 and the other says $2.50. 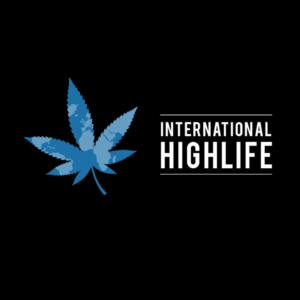 Similar to people who exclusively purchase high-octane fuel, there is an expansive culture of premium cannabis customers. Variables like THC percentage, exotic strains, and organic production are just a few to name. You would expect that premium weed, will cost a premium price. On the flip-side, people on a budget, or those who only smoke once-in-a-while probably buy the $7g over the $20g. Determining the price of weed on the black market is a double-edged sword. The fact that you can face serious legal consequences for simple possession is enough to demand a higher price. We all know that the black market doesn’t follow any traditional rules. Cannabis became a means to profit by transporting into states where it was illegal from places where it wasn’t. Therefore, the answer to how much does weed cost in Texas is different than in California. There are no ways of telling if cannabis has pesticides, and sometimes other problems like mold can be hard to detect sometimes. Often, quality control doesn’t exist in the black market. 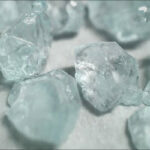 Most drug dealers feel extreme pressure by selling an illicit substance. However, in states that only have zero-tolerance or mild decriminalization laws for cannabis, your options are limited. Unless you live by a dispensary near the border of a recreational state, you go to your dealer. This is why dealers can set their price in illegal states. Traditionally, the price of marijuana is always subjective to its price on the black market. The criminalization of America’s #1 illicit substance only makes it that much more valuable. Before cannabis became accessible in dispensaries, pricing has always been the dealer’s choice. You pay whatever price your dealer says, or find someone else to buy from. Often your only viable alternatives are either finding another dealer or a trek to your nearest dispensary. Besides, you have to trust that the weed you’re buying is what your dealer claims it is. You have to stay educated and understand that people are always looking to take advantage of you. If that means they’re lying to you about the strain, or the THC percentage, or the weight, then they’ll lie. At the end of the day, it’s all about making money. How Much Does An Ounce Of Weed Cost In Dispensaries? An ounce of weed from the dispensary can range from $200-$360 in California for medium to top shelf. The results of professional branding and marketing of cannabis products can be found all around us. The days of buying bags from a parking lot and going home to roll a joint are long gone. That’s not to say there’s a problem with rolling and smoking your joints. There’s a time for everything, and some people enjoy the ritual of rolling and smoking their joints. However, they are in the minority as far as canna businesses are concerned. 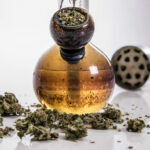 Especially in legal markets, the price and sale of raw cannabis are down, while unique products continue to exceed expectations. Marketing cannabis products is all about convenience, discretion, potency, and presentation these days. People will spend more money on cannabis products which are convenient to consume, discrete and high in THC/CBD. This lead dispensaries to partner up with budding entrepreneurs to create brand new markets of niche products. Dispensaries tend to invest a majority of their time and energy towards products with very high THC percentages. 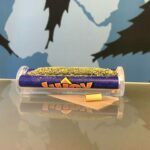 Popular products like hash oil cartridges, exotic concentrates, and top-shelf pre-rolls dominate many dispensaries. Dispensaries get a wide range of customers every day, from first timers to seasoned veterans of cannabis culture. Medical dispensaries flew under the radar for a long time in those states that allowed medicinal cannabis. This was mostly out of fear that patients would no longer have access to their medication, should the DEA raid their dispensary. We believe it’s fair to say that while dispensaries have been around for many years, legalization reinvented their purpose. In 2012 when Colorado and Washington State first legalized recreational cannabis, they pioneered recreational dispensaries until 2014. Unfortunately, they also were immediately faced with an unprecedented shortage; the same thing is currently happening in Canada. When you look at the statistics, customers purchase so much weed during the first week of legalization, that states run out of cannabis. To combat the shortage, growers and dispensaries had to find a solution to prevent short- and long-term consequences. 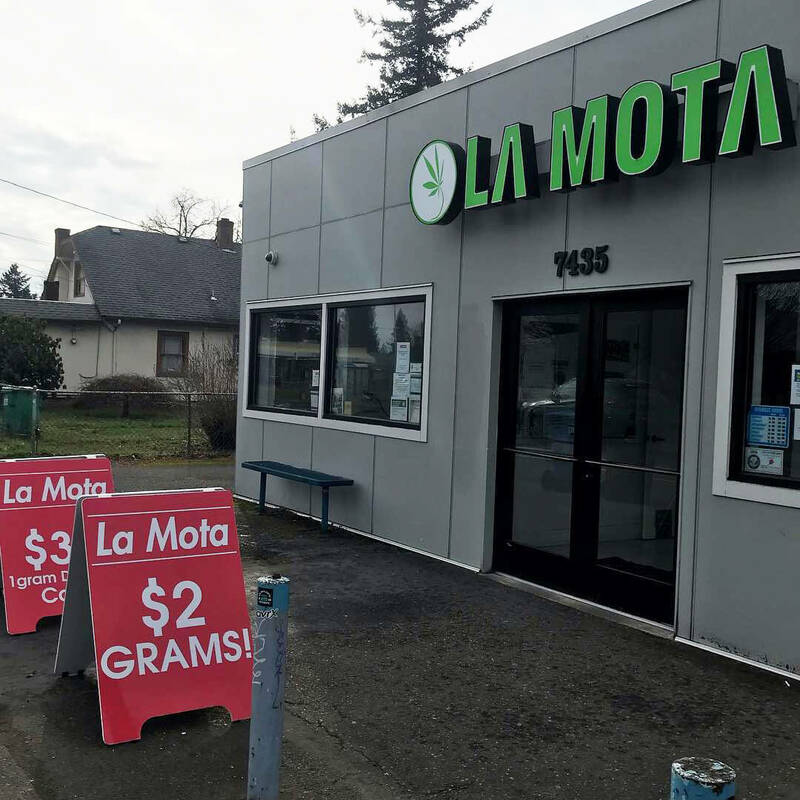 During Washington State’s first week of legalization, mid-grade cannabis sold at around $15/g, before tax. If you add a 37% sales tax, the total price was about $20/g. Today you’ll only pay half the price ( $10/g). The business was booming and made the state millions of dollars in a matter of days. So why is this an issue at all if they were making so much money? Well, to meet the excessive demand, growers increased their yield of cannabis plants between 200%-300%. Dispensaries then purchased more plants for a lower wholesale price and sold those plants at a lower price. For states with new legalization measures voted in, they face these same problems just as Washington and Colorado did. In 2019 there is still a massive surplus of cannabis plants. This over-saturation of weed causes a sharp decline in price (retail and wholesale). Now, with all the information in order, we can successfully gauge the price of cannabis-based on its location. We know the cost of weed ties right back into the economics of cannabis. Canada legalized recreational marijuana in October of 2018 and showed signs similar to the US. Right now, it’s still too early to analyze the price of weed in Canada for reasons mentioned earlier. Canada has such a high demand for pot in 2019 that they are facing a huge shortage. Reports claim that prices are up to 80%, compared to legalized states in the US. Canada’s legal market is still in its infancy and may show pricing stabilize over the next couple of years. The way the law currently stands. One thing is for sure though; legal cannabis is approx. 50% more expensive then the products you can find on the streets. Currently, 17 of the 50 states still treat marijuana and THC/CBD as a Schedule I drug. States like Alabama, Idaho, and Nebraska are a few to name from the full criminalization list. 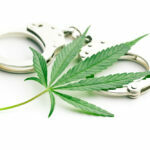 These states impose misdemeanor charges, and severe criminal penalties to anyone found guilty of possessing marijuana. In many cases, those same laws include a felony enhancement for any concentrated marijuana products. This means that a joint could send you jail, but a pot brownie will send you to prison. States without marijuana legislation are home to thriving illegal cannabis markets. The demand for weed doesn’t change based on its legal status, which only drives customers to the black market. The price of black market cannabis varies on a dealer-by-dealer basis. If someone is willing to pay $30 for a gram of weed, then that’s what the price is. 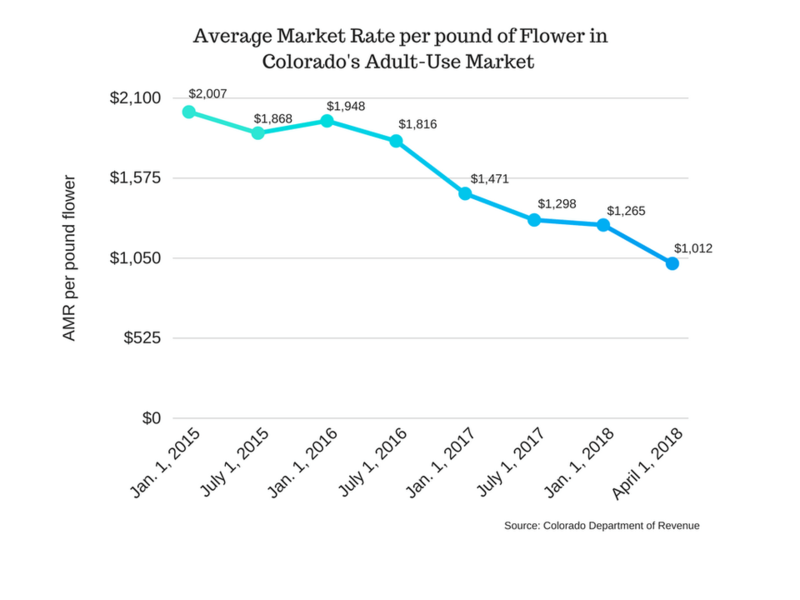 As you can see in the chart, the price of cannabis in Colorado has experienced a major drop since the legalization. The only restriction on cannabis in legalized states is about quantity and illegal sales. A common misunderstanding of the correctional system is that drugs don’t exist behind bars. The fact of the matter is that all drugs exist in virtually any jail or prison. When inmates have to sit in a cell for 23 hours a day, they look for ways to make that time go by faster. Weed is a common way for inmates to pass the time and make some money on the inside. The price of cannabis behind bars is tricky to identify because it’s a black market, within a black market. Some facilities allow personal accounts where money can be deposited on a prepaid card or using the account itself. Other facilities use more traditional means of currency like trading commissary items. Commissary items generally have a value assigned to them based on many different variables. Things that are high in demand like coffee or e-cigarettes will be worth more. Products that are easier to transport through a facility are also worth more. How Much Does Marijuana Cost In Jail? Since it’s harder to get weed in prison, the available products are hugely overpriced. The value of a small joint with less than 0.5g rolled into it, can be worth over $50. On the other end of the system, minimal security facilities generally house inmates in a dorm-like fashion. These prisons give inmates much easier access to cannabis and the means to pay for it. The average price for 1g of marijuana in minimum-security prisons is around $50. This is higher than you’d expect in the free world but is not unreasonable by any means. Help us make the most accurate list of the current weed prices around the world. Please let us know in the comments how much you pay for your cannabis and where you’re from. We want to know dispensary and black market prices!